Dig into this party favorite game-friendly snack, made keto and dairy-free! 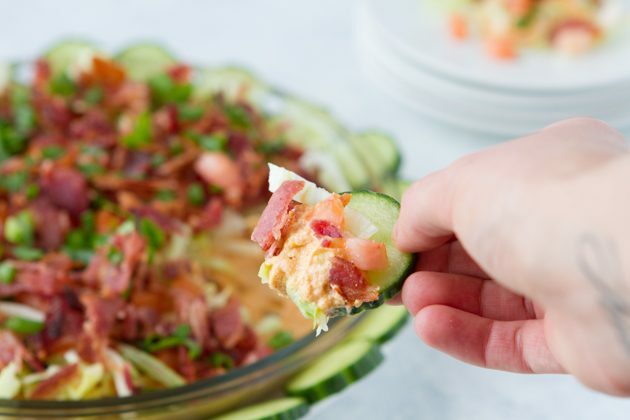 Smooth “cream cheese” spread topped with chunky bacon bits, tomatoes, lettuce and green onion. Keep it low-carb by serving with vegetable rounds such as cucumber, zucchini, or jicama. This keto snack is absolutely perfect for game days and pretty much any event where food is concerned. Why is it “absolutely perfect,” you ask? Great question! First of all, you can put it on a table and everyone can gather around to dig in… no utensils required. 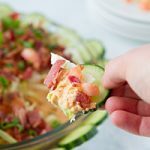 The veggie rounds (or whatever you decide to serve with the dip) are a nice crunchy contrast to the smooth BLT dip, but they also allow you to avoid needing forks or spoons for everyone. Another awesome perk is the ability to enjoy the pure joy of eating “cream cheese” without the dairy. I know a lot of you out there are like me and just can’t do dairy, so this will be especially nice for you. No need to miss the good ol’ days of dairy when you’ve got lots of great alternatives like this one. Of course, the Vital Proteins Collagen in this keto recipe takes it to the next level. I’m often asked how to add collagen to everyday items, and here’s a great example of how to do that. As you can see, adding collagen to recipes is simple. 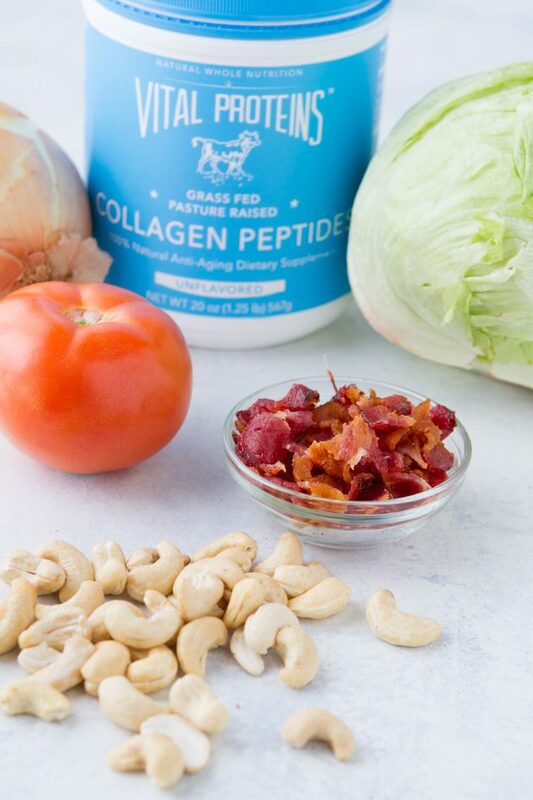 Collagen is extremely useful for strengthening bone and cartilage, improving resistance, rebuilding muscle, developing resistance, and enhancing elasticity and joint mobility. It’s amazing how much it actually helps your body heal! 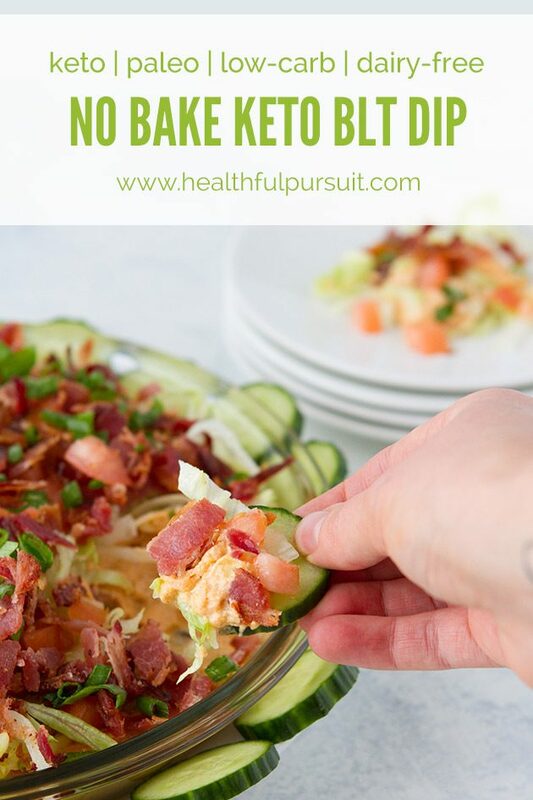 One of the best perks of this keto recipe is actually how easy it is to prepare… no bake! That means it is great for any time of the year… even in the summer when it’s boiling outside and you’d rather not heat the inside of your home with the oven. Especially if you prep beforehand, this recipe will be a breeze to make. Easy peasy. That means more time to enjoy my snacks and thinking up new recipes! Ready to get started? Here’s the recipe! Dig into this party favorite game-friendly snack, made keto and dairy-free! 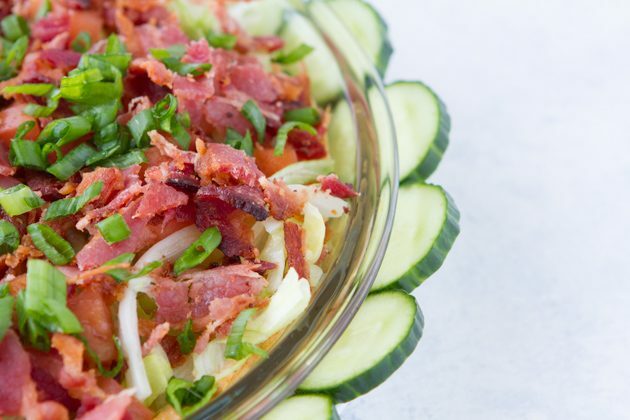 Smooth “cream cheese” spread topped with chunky bacon bits, tomatoes, lettuce and green onion. Keep it low-carb by serving with vegetable rounds such as cucumber, zucchini, or jicama. MACROS: Fat 65%, Carbs 13%, Protein 22%. Transfer warm bacon grease to the bowl of your food processor or high-powered blender along with soaked cashews, peptides, mayo, lemon juice, vinegar, garlic, onion, paprika, salt, and pepper. Pulse until smooth, about 2 minutes. Transfer the mixture to a 9-inch (23 cm) pie plate. Top with iceberg lettuce, diced tomato, crumbled bacon, and sliced green onions. Serve alongside sliced cucumber, bell pepper, celery, or the vegetable of your choice. Don’t forget to comment below and let me know what occasion you’ll be making this recipe for!